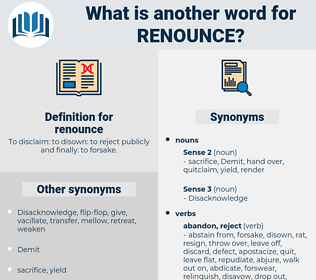 What is another word for renounce? To disclaim: to disown: to reject publicly and finally: to forsake. 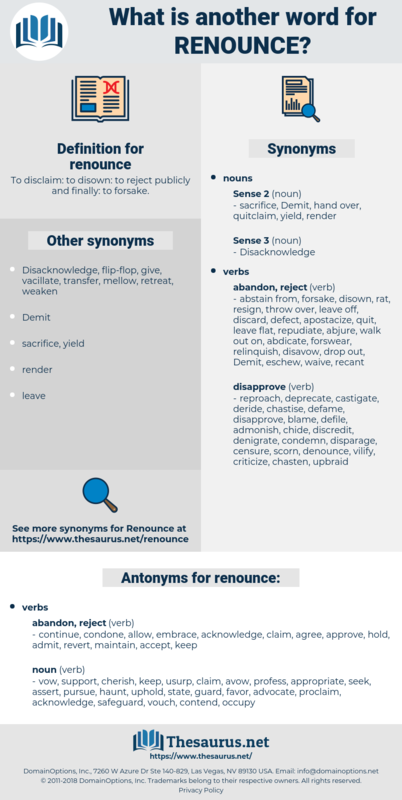 waive, lay, reject, surrender, repudiate, disown, cease, forfeit, resign, discontinue, retract, discard, cede, renege, condemn, condemns, withdraw, stop, scrap, rescind, deny, refuse, concede, refrain, quit, disclaim, shun, cancel, waiver, abolish, leave, jettison, resist, lose, divest, ignore, reverse, eschew, dismiss, terminate, reprove. forgo, denounce, forsake, abdicate, dispense, drop, desist, abrogate. continue, condone, allow, embrace, acknowledge, claim, agree, approve, hold, admit, revert, maintain, accept, keep. uphold, protect, confiscate, retain, vindicate, declare, vow, cherish, advocate, haunt, confirm, endorse, profess, support, appropriate, contend, state, favor, wrest, undertake, seek, secure, pursue, safeguard, assert, proclaim, vouch, usurp, prosecute, guard, back, avow, adhere, court, seize, occupy, defend, own, arrogate, affirm. Still I could not make up my mind to renounce the natural sciences. Upon this we held a conference, the result of which was that on the 20th the Prince de Conti told the Parliament that himself and the other generals entered their claims solely for the purpose of providing for their safety in case Mazarin should continue in the Ministry, and that he protested, both for himself and for all the gentlemen engaged in the same party, that they would immediately renounce all pretensions whatsoever upon the exclusion of Cardinal Mazarin. Raininess, room access, remiss, renege, Rheims, Ramses Ii, Rawness, rhamnaceae, remus, Remise, Ramesses Ii, rhyniaceae, riming, rangy, rinse, rearrange, remains, range, ramose, Rameses Ii, raining, running, rain-wash, rameses, rhenish, rhyming, ramous, ruinous, rum nose, roominess, romish, rowing, runic, raunchy, romaic, ranch house, ramus, rumex, rayons, remake, Rumansh, rain gauge, rehearing, rink, roanoke, rummage, rimose, rain gage, renewing, ring, reminisce, rearing, rings, Romansh, romanize, rooming house, ranch, Raunch, romanise, ramses, rank, rhonchus, rareness, Romans, Reims, Romanic, rung, rain check, running away, rooms, romance, roaring, runniness, ramesses, rhamnus, ransack, ruining, runch, rnase, raring, running shoe, remaining, reharmonise, reharmonize, roman nose, romanesque.